Handy for station (5 minutes). One pub area, with 5 ales on, and an almost separate dining area, that I didn't try. It gets worse. 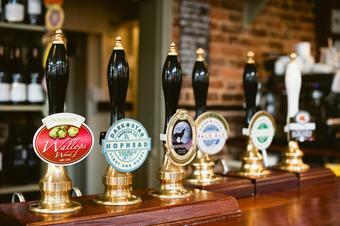 Beers are often off, and the hand pumps have been abandoned as they cannot keep them clean. A shame. Try the Town House on the High Street. Amazing what a change of management can do. Beer still as good as ever, but food service is now dire. Recently for 90 minutes to get our food! Excellent choice and quality of real beer. 5 on plus a real cider. Food is superb. Had the Dark Star Hophead although there was Original there as well. Others included Bowman so a locale feel to the choice. As WeazelTimes says how good to get away from the Fullers etc. At least a pub here with freedom and imagination. It does have the look of a very clean pub from the outside and turns into more of a restaurant on the inside. Let’s be honest this is no.1 an eating establishment without the usual pub grub. But the staff are very welcoming, very efficient and helpful. The building is light and airy, while being split into three rooms creating nice cubby holes. Plenty of seating and nice decor (if a little twee but designed for the older eater) it really sets this place off well, and no music (yippee). As to the beer it is advertised as a Free House, and what a change that is from the local ‘Spoorers and Fullers. I still regret’s the take-over of Gales by the mighty Fuller’s, and I’m a Londoner. The good selection of ales was a treat, the Dark Star was great. I visited at lunch time so I have no idea if proper beer men turn up here or not, but they should come here. My only negative points are first a chair with the Yanky flag on the material, which I notice also appears on the web site. If I had seen that before my visit I most likely would not have gone. Canada is still celebrating the War of 1812 (which dragged on until 1814) when the Yanks tried to conquer them but failed, so the flag should be a lovely Maple Leaf. My second point is the use of Israeli cous cous on the menu, surely it should have been Moroccan or Palestinian would have been fine. But please go for the beer.